Google has long-held the motto “don’t be evil,” but what if their 50.2 billion dollars in revenue made it into the wrong hands? There’s almost no limit to what could be done. 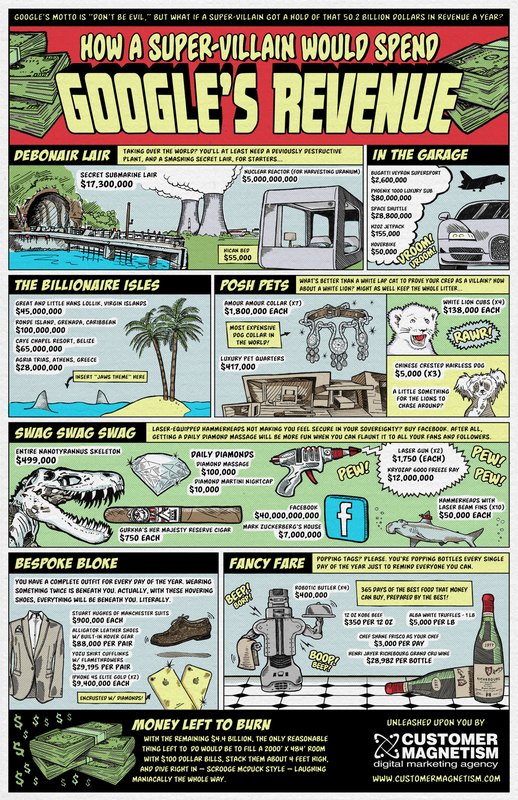 In this hand-drawn, comic book-style infographic of comigraphic, Customer Magnetism explores what could happen if a super villain got a hold of Google’s 2012 revenue. In fact, theoretically spending 50.2 billion dollars in a year, even for a super-villain, would be so difficult that a remaining $4.4 billion would need to be stacked four feet high in $100 bills to create a Scrooge McDuck-like money pool.